Here is a trendy card created with a new Hampton Art stamp set and KI Memories Playlist collections papers and embellishments. The card base was first covered with the black dot paper with two border strips below. The blue border strip was adhered to card with 3D foam dots. Then utilizing the stamp set theme I decided to pair it up with a camera mini placemat from Jillibean Soup and positioned it onto card as shown with 3D foam dots after I added the gray star paper as a backer. 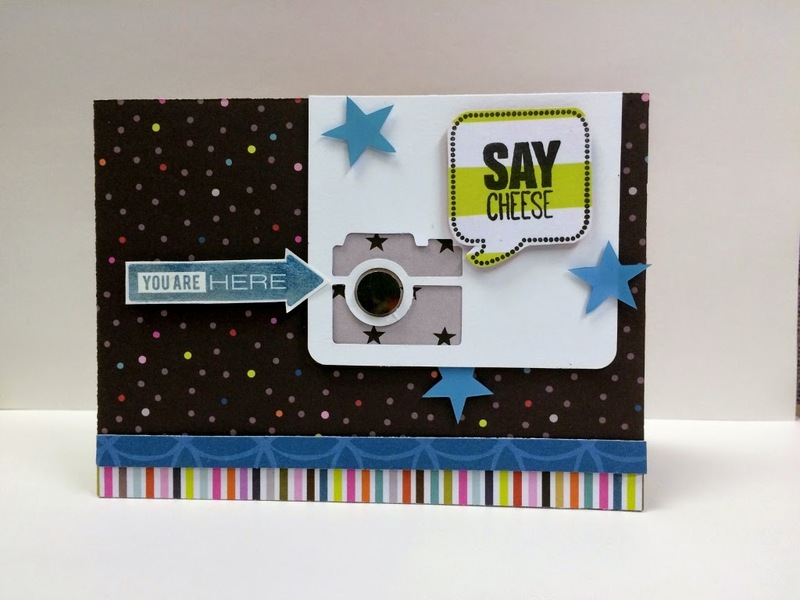 The arrow sentiment was stamped in blue onto plain white cardstock and the Say Cheese sentiment was stamped in black ink onto the striped KI Memories paper. Both were then added to the card with 3D foam dots as pictured. Last I embellished the camera center with a gemstone and added three stars as shown. This could be a fun recognition card for any camera worthy event.